More than any other state, California offers a broad range of finance programs specifically targeted at promoting innovation and deployment of advanced energy technologies. In addition to these ongoing programs, the state is looking to invest an additional $850 million in cap and trade revenues in advanced technology projects throughout the state. 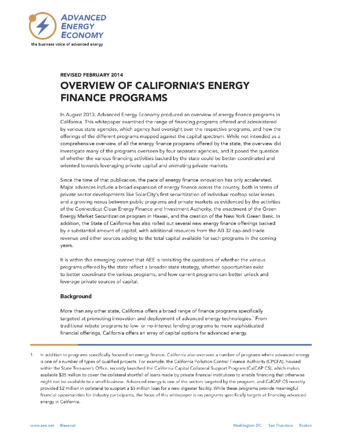 In this recently updated white paper, AEE examines the current energy finance programs in California, the agencies charged with administering these programs and how California's various existing advanced energy finance programs map against opportunities for involving private sector capital. It offers recommendations to align and coordinate these efforts so that new and existing investments are maximized and leveraged to achieve greater results. Please fill out the form to read the full paper.